Metal Foils (Thickness ～0.10mm ：SK, SUS, SPCC, Non-ferrous) | TOKUSHU KINZOKU EXCEL CO.,LTD. *Depends on grade and thickness. Contact us for more details. We anneal and repeatedly roll the coil substrates to reduce their thickness. Materials produced in this manner that are less than 0.10 mm thick are generally referred to as "foils." In recent years the trend has been towards designing parts that are lighter, thinner, shorter, and smaller, and reducing the thickness of existing materials is an effective was of achieving these aims. Lately we have been receiving a lot of inquiries from customers interested in switching to foil in order to reduce the thickness, weight, and size of components. We manufacture metal foils using SUS301, SUS304, SUS631, SUS420J2, SUS430, SPCC, and SK grades, but can also use non-ferrous metals and other materials if supplied. 1. Thickness is measured at an arbitrary point 100 mm or more from either side of the material. For products that are 20 mm wide or less, thickness is measured at a point along the center of the product widthwise. 2. If you require a product that is slightly wider/narrower than the nominal dimensions along only one side (unilateral tolerance), ensure that the product you choose is within the allowable thickness range of the combined total of the tolerances in the table above. 3. In certain cases, it may be necessary to consult us separately regarding SS-grade thickness tolerances. 1. In certain cases, it may be necessary to consult us separately regarding thicknesses less than 0.30 mm. 2. Consult us if you require particularly precise width tolerance. We can apply nickel plating and precious metal plating to electronic component applications, where there is a large need for plating. Although we outsource the plating process itself, we can help reduce work for you through our uniform management of quality that also covers plating. 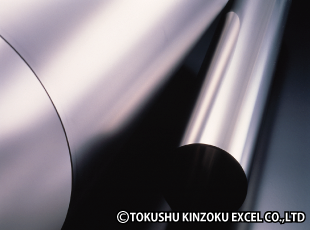 We were the first company in Japan to successfully roll steel with a thickness of 10 μm. We also have various management criteria for quality control of surface defects—an area that is in big demand in electronic component applications and other fields. Contact us for more details. Whereas the majority of metal foils on the market are hard finished products, we manufacture our metal foils to the hardness you require. *Available finishes depend on thickness. Contact us for detailed specifications. In addition to the widely available SUS304 grade, we also supply ferrous materials such as SUS301, SUS631, SUS420J2, SUS430, SPCC, and SK grades, and also provide non-ferrous metals such as copper. We offer ultra small lots for prototypes (in units of 1 meter) and A4-size cut samples and other ultra small lot samples. If you require metal foils in small lots, short delivery times, and high quality, visit our online shop "Stainless Foil Market" (link opens in a new window). As material properties depend on the steel grade required, refer to the page for the relevant grade, and request the hardness (finish) you need. Certain finishes are not available depending on thickness, so please consult us before finalizing your order. *In the case of ultrathin foils, it may not be possible to use soft materials such as those with an annealed or BA finish because of their susceptibility to certain problems (such as breakage or wrinkling).